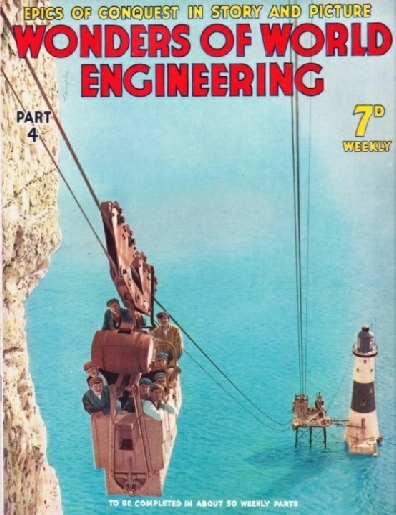 Part 4 of Wonders of World Engineering was published on Tuesday 23rd March 1937, price 7d. Part 4 includes a colour plate From Cliff Top to the Lighthouse illustrating the article on Sentinels of the Sea. The plate also appeared as the front cover of this issue. From Cliff Top to the Lighthouse: the colour plate accompanying the chapter on Sentinels of the Sea shows workmen travelling on the cableway at Beachy Head Lighthouse. The plate is a reproduction of this week’s cover. NIZAMSAGAR DAM, built over the River Manjra, is part of a huge irrigation scheme carried out by the Governemnt of Hyderabad. 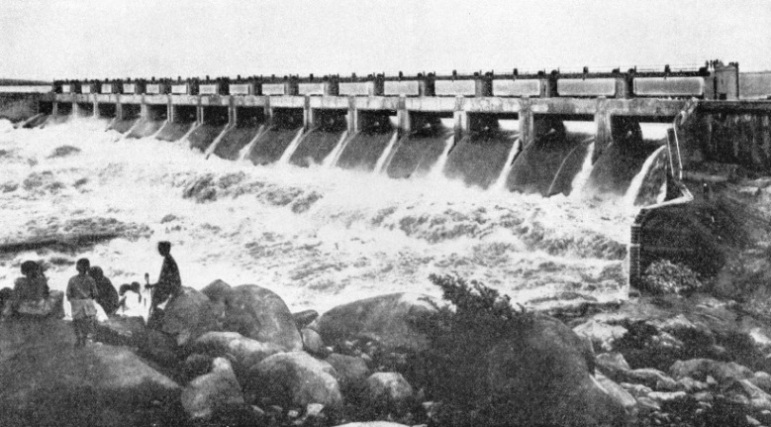 More than 20,000,000 cubic feet of earth and stone were excavated for the foundations of the dam. The enormous flood gates, which weigh 17½ tons, are 40 feet high and are 15 ft 6 in wide. The story of canals, dams and barrages to help stamp out famine in India. The chapter is by Harold Shepstone and is the second article in the series on Triumphs of Irrigation. It is concluded from part 3. Extraordinary ingenuity, courage and determination are shown by the engineers who build, in dangerous and difficult conditions, the lighthouses which guide and safeguard ships at sea. Most lighthouses are built on or close to the land, and it might seem that no special difficulties would present themselves when a lighthouse had to be built so near the amenities of everyday life. However this chapter, by Harold Shepstone, shows that extraordinary ingenuity, courage and determination have been displayed by the engineers who have built some of the world’s most famous lighthouses. This chapter deals also with the technical equipment inside a lighthouse. There is an article with photogravure supplement on lighthouses in Shipping Wonders of the World, and you can read Frederick Talbot’s book Lightships and Lighthouses (1913). Click on the small image to see a short British Pathe newsreel clip “Safety Lights” on lighthouses and lightships (1938). 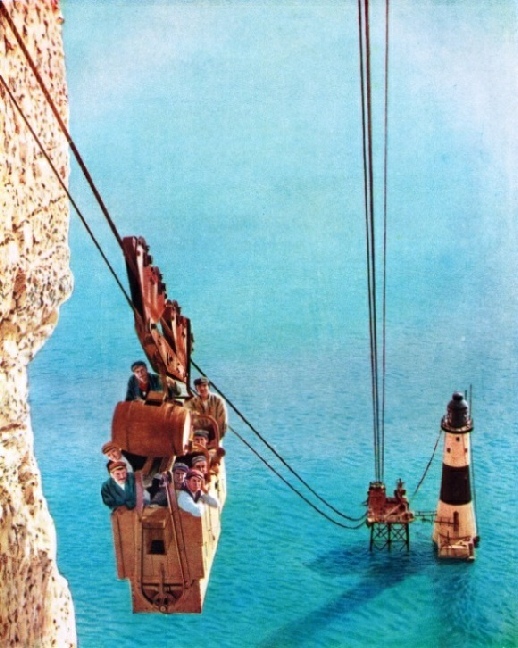 FROM CLIFF TOP TO THE LIGHTHOUSE, which was built 500 feet from the base of Beachy Head, Sussex, men and materials were transported by a cableway. The original lighthouse at Beachy Head was on top of the cliff, but because the light was often obscured by fog, the new lighthouse was built at sea level. 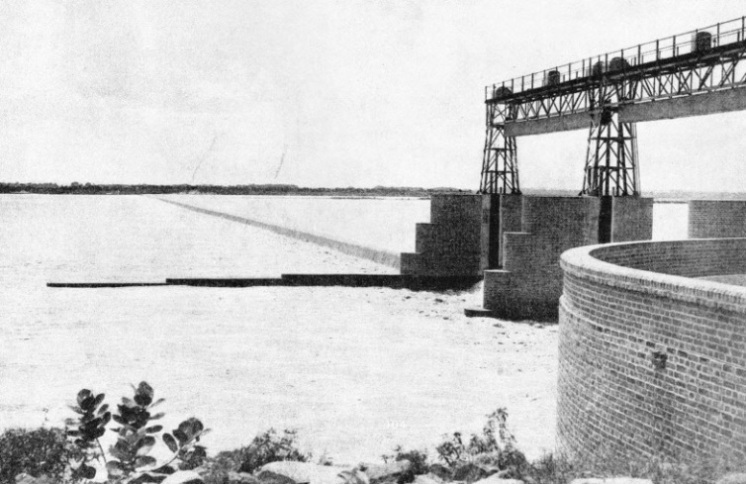 A cofferdam was built on the site, and pumps kept out the water while the tower was being constructed. The lighthouse is 103 feet high. 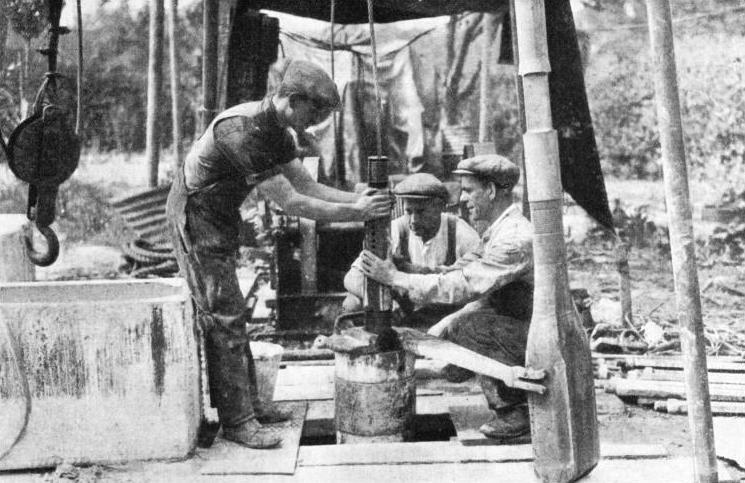 You can also read Walter Cox’s book Artesian Wells as a Means of Water Supply (1895). AT WORK ON A 12-IN. DIAMETER BORING. This view, taken from below the pulley of a sheer-legs, or derrick, shows men setting the “string of tackle”, at the lower end of which is the cutting bit, with “jars” or sliding links, between the chisel and rope socket. 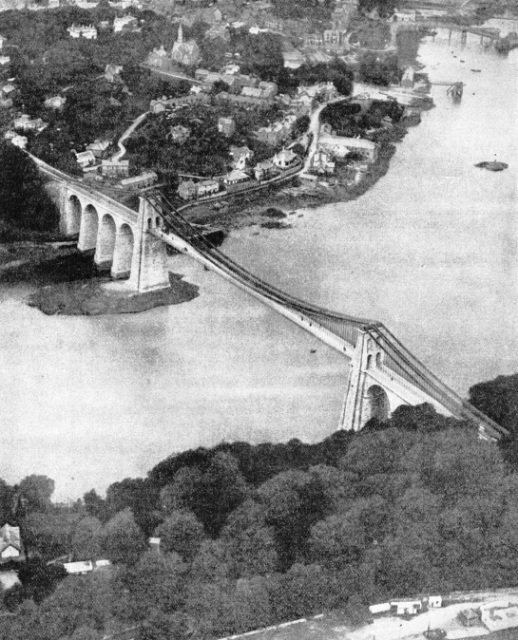 Although the suspension and tubular bridges over the Menai Straits were built many years ago, they are still classed among great engineering achievements. These remarkable bridges taxed all the skill and ingenuity of their designers, Thomas Telford and Robert Stephenson. You can read William Fairbairn’s An Account of the Construction of the Britannia and Conway Tubular Bridges (1849), Samuel Smiles’ account from his Lives of the Stephensons (1894 edition), and an account of the Menai Suspension Bridge in Samuel Smiles’ The Life of Thomas Telford (1864). Large-scale production of motor-cars is made possible by the specialization and organization of a vast number of engineering processes. The building of Morris cars affords an excellent example of the methods adopted in the industry. Motor cars are a commonplace of our daily life. Many people use them and all of us see them, but not everyone realizes that modern motor car manufacture gives us material for one of the greatest stories of engineering. This chapter by Sidney Howard deals with the manufacture of the modern car and the organization of a typical plant. The factory with which this chapter deals is that of Morris Motors, at Cowley, Oxford. 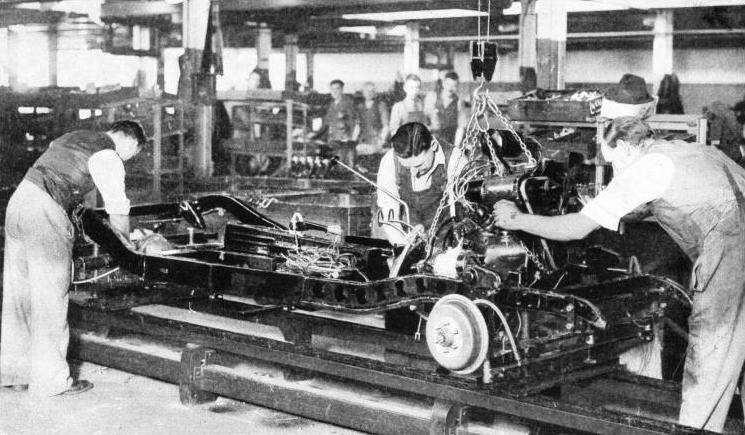 I have chosen the Morris factory not because I have any particular bias towards the Morris cars, but because I can only devote space to one example of a large-scale plant, and because the story of Lord Nuffield’s rise to fame is in itself one of the romances of engineering. As Mr W. R. Morris he began his career by supplying and repairing bicycles at Oxford. Then he carried out the experiments which led to the building of the original Morris car and to the remarkable developments associated with his name. A WEATHER MACHINE which reproduces the effects of two years' British weather in less than a fortnight is used to test the fabrics and paints required in making a Morris car. Samples are fitted into containers on the walls of the cylinder shown, and. are exposed to intense rays from the powerful daylight lamps above. Revolving jets of water spray the samples as if with rain. At the end of the test no fading should be visible to the human eye. OVER SNOWCLAD MOUNTAINS the track of the Iron Ore Railway was built in the face of all the privations and dangers of Arctic weather. Owned now by the Swedish State Railways, the first section of the line was opened in 1883 by the North European Railway Company, promoted in Great Britain. 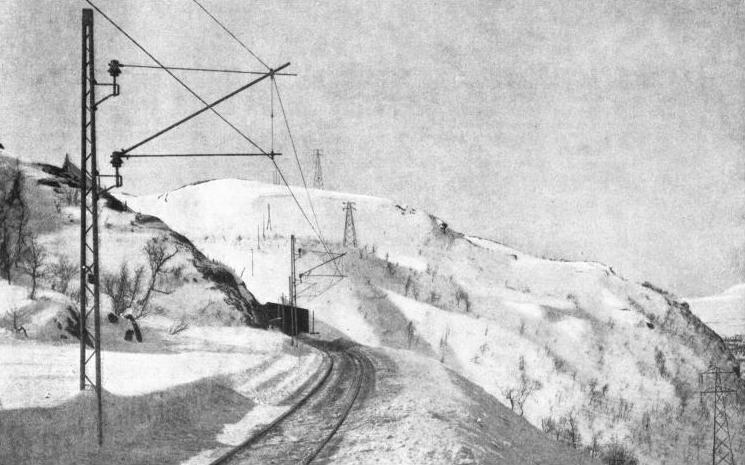 Between 1914 and 1923 the line was electrified on the overhead system, the conductor rail system being unsuitable for a line through country subject to heavy snowfalls. 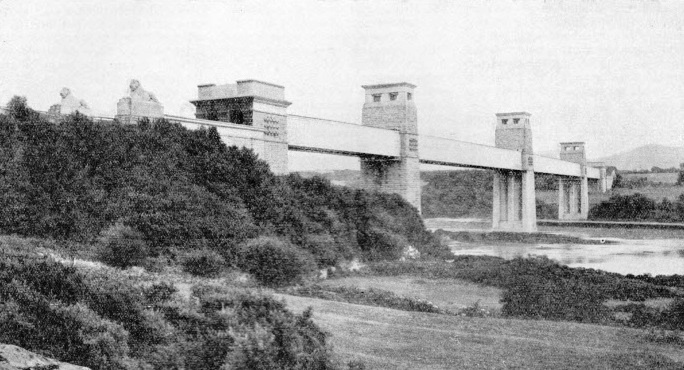 TOWERS AND ABUTMENTS of the Britannia Tubular Bridge were built while the iron tubes were being assembled on the shore. The central tower, known as the Britannia Tower because it rises from the Britannia Rock, is 230 feet high. For this tower 150,000 cubic feet of Anglesey marble and an equal quantity of limestone were used. The land towers reach to a height of 160 feet. 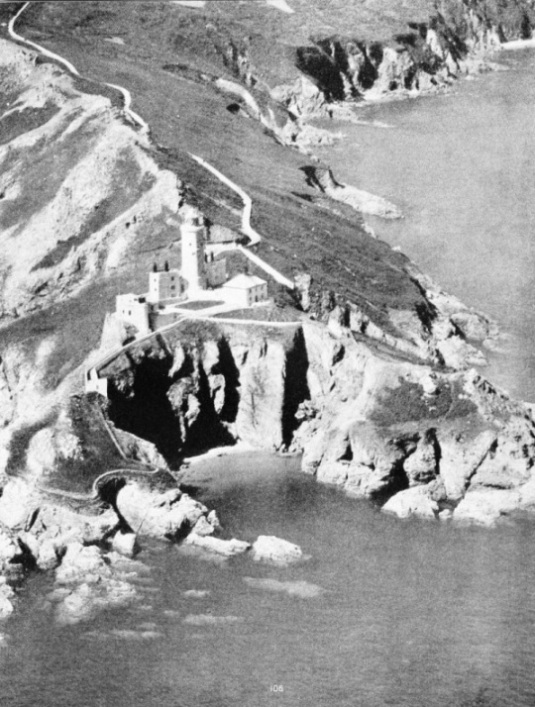 A LIGHT WELL KNOWN TO MARINERS is that on Start Point, Devon. The lighthouse is built on the cliff, 140 yards from the extremity of the promontory. The lighthouse is equipped with an automatic radio beacon, which radiates periodically the letters G S M in Morse. THE SUSPENSION BRIDGE across the Menai Straits from Bangor to Beaumaris has a central span of 550 feet, which in Telford’s day was unprecedented. The approaches to the central span carry the road over two short embankments and seven arches, each with a span of 52 ft 6 in. Four of these arches on the Anglesey side and three on the mainland side of the bridge. The roadway is suspended by iron rods from great chains which, anchored in the rock at either end, pass over the tops of the massive masonry piers. Beyond the Arctic Circle in Sweden, engineers have built a railway to open up a valuable natural deposit of iron ore, and Nature has been harnessed to supply the power for the railway. The article is concluded in part 5. This railway is also described in Railway Wonders of the World.